“We are here in solidarity with the 150 to 300 immigrants who are detained here at this facility. They are asylum seekers. They are green card holders. They are long-term residents,” says the Rev. 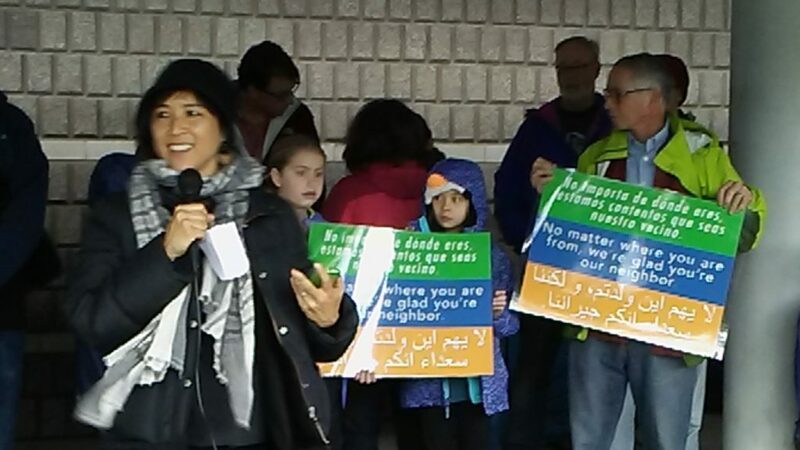 Deborah Lee to over 200 people gathered for an interfaith vigil at the Contra Costa West County Detention Facility in Richmond on March 4. Lee is Northern California Director of Immigration for the Interfaith Coalition for Human Integrity (http://www.im4humanintegrity.org/). “We stand here because this is just one of over 250 immigration detention centers across the country. Many of them are county facilities, like this one, but the majority are private, for-profit facilities owned by GAO and CCA,” adds Lee, to boos from the crowd. “Seventy percent of the people detained here are pre-trial. They have been granted bail, but they cannot afford it,” says Lee. The detention center backs onto Pt. 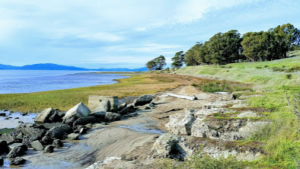 Pinole Regional Park, which hugs the San Pablo Bay and offers fantastic views in all directions. The Hayward Fault runs along the western edge of the park, forming a scarp. But, detainees are unlikely to see this park except when they are transported to and from the facility. 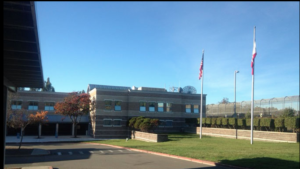 Many of the families in the detention center come from around the East Bay, including Oakland. 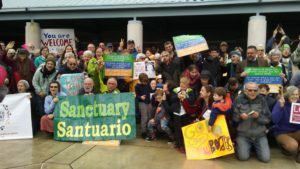 Since April 2011, people have been gathering on the sidewalk outside this facility for a vigil that is held at 11:00 a.m. on the first Saturday of each month. People of all faiths, as well as people with no faith, join together to show solidarity with the detainees. The participants stand in a circle under the overhang and, if it’s a fine day, beyond the overhang towards the parking lot. Since the new president took office in January, the crowd has grown from about 50 to over 200, reflecting the many concerns that people have about how the new administration is treating immigrants. Each month, a different organization leads the vigil. The March gathering is being led by students from Bishop O’Dowd High School in East Oakland; about 15 students and several teachers are present. Tri-an Cao lives in Oakland and is a student at the school. She has come to four vigils and, after the January vigil, wanted to lead one. So, Tri-An and her brother, Tam, whose parents are refugees from Vietnam, organized the March vigil. They advertised the event at their school through flyers and talking with friends. Tri-an also suggested to teachers of religion classes that they give extra credit to students for attending the vigil; at least two teachers did so. 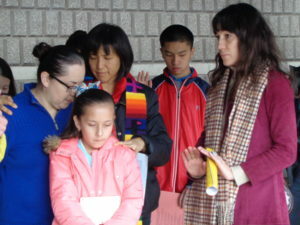 “We all have connections to immigrants or refugees and we strongly support our brothers and sisters and their families who are suffering because of ICE or the administration targeting and harassing our brothers and sisters,” Tri-an says, gesturing to the other Bishop O’Dowd students who have gathered around her. “I keep coming back to this vigil because it’s an important cause for me as a child of refugees. It’s very dear to my heart,” she says. The vigil begins with participants giving their names and organizations they’re aligned with, but because of the size of the crowd in March, Lee asks people to simply call out their organizations. These include churches, synagogues, schools, colleges, and peace and justice organizations, such as School of the Americas Watch (SOAW: http://www.soaw.org/), Friends of Sabeel-North America (FOSNA: http://www.fosna.org/), and Jewish Voice for Peace (JVP: https://jewishvoiceforpeace.org/). Vigil participants then hear testimony from family members of detainees and their advocates. In March, they hear about Oswaldo Martinez, who came to the U.S. many years ago when a teen and may be deported very soon. He has been in the detention center for over a year as his family cannot afford the bail. He recently lost his asylum case, but it may go into appeal. Oswaldo’s wife, Leticia, and 10-year-old daughter, Alexandra, both U.S. citizens, have come to the vigil with their advocate, Christina Mansfield, co-founder and co-executive director of CIVIC (Community Initiatives for Visiting Immigrants in Confinement: http://endisolation.org). Leticia is unable to work because of health issues and both she and Alexandra are deeply concerned that their family may be permanently separated. “Oswaldo had some minor criminal interactions, misdemeanors. Because of the way many misdemeanors are categorized under immigration law, they are categorized as aggravated felonies. But they’re neither aggravated nor felonies. It triggered the ability for the government to detain and deport him. If he were a citizen, this wouldn’t have happened to him,” says Mansfield in an interview. 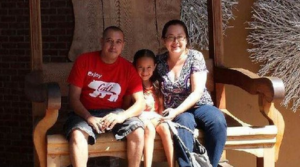 Oswaldo’s family is working with Mansfield to have his case administratively closed. “Oswaldo is no danger to our community and the real danger is if he was deported and his family is left behind,” says Mansfield. The Rev. 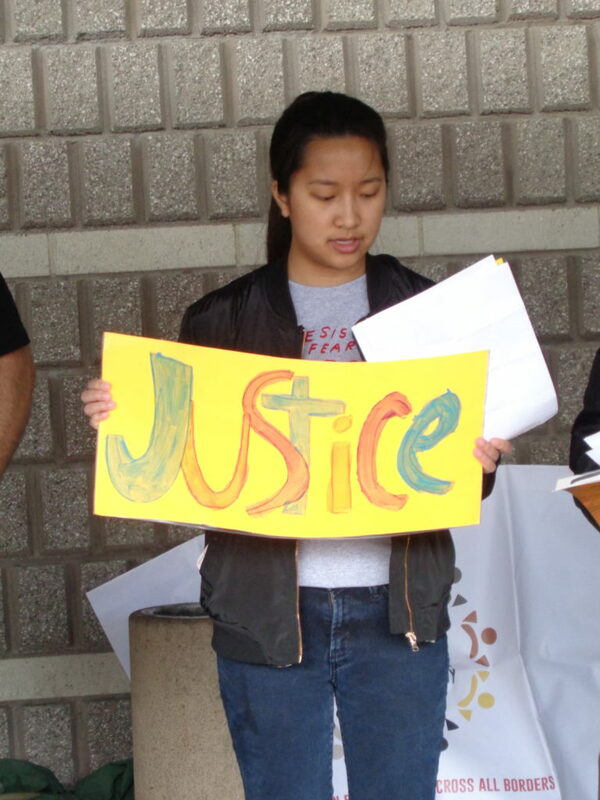 Lee urges vigil attendees to sign a petition to stop the deportation of Oswaldo; the petition can be found at: https://www.change.org/p/immigration-and-custom-s-enforcement-stop-the-deportation-of-oswaldo-martinez. Vigil participants also hear from immigrants. 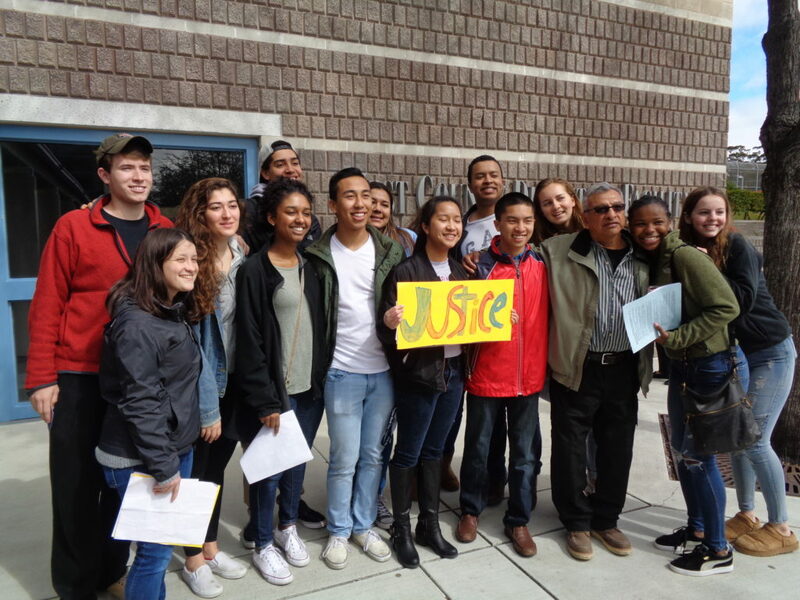 In March, Alberto Perez, the janitor at Bishop O’Dowd High School, shares the circumstances in 2003 that led him to flee his homeland, Guatemala. He was working on a farm in a remote part of the country and there was a dispute over land boundaries. One evening, he and a friend overheard their boss arranging for the killing of the owner of the neighboring property. His boss suspected that Alberto and his friend had overheard. “I suspected that he wanted to kill me. For that reason, I had to take the decision to leave. I talked with my wife that night and told her I had to leave. 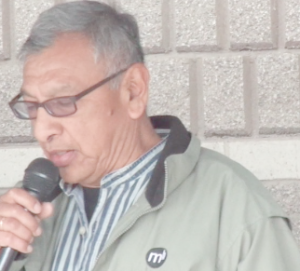 I had to disappear from the region,” Alberto told us through student interpreters. He hasn’t seen his wife or children since 2003. Towards the end of the vigil, participants pray for and pledge solidarity with people who are affected by immigration policies, war, and government-sponsored violence around the world. In March, these include a local 5th grade Latino student who is being harassed by other students, who tell him that he will be deported; a Bishop O’Dowd H.S. student who was recently deported; and Berta Cáceres, a Honduran indigenous environmental activist who was murdered in 2016 (https://www.theguardian.com/world/2016/mar/03/honduras-berta-caceres-murder-enivronment-activist-human-rights). The vigil always ends with participants making “joyful noise” for several minutes, a show of solidarity with detainees: voices shout out and sing loudly, pots are banged with lids, empty coffee cans are thumped with sticks, and drums are beaten. “I think it’s pretty hard for them (detainees) to hear (us) when they’re in their locked facilities. If they’re moving from one building to another building, they would be moving outside, and then they’d be able to hear. The other way that people know is that we’ve been able to tell the families and the attorneys, to let them know that we’re out here in support of them, that they’re not alone. I think that’s an important message,” says Lee in an interview at the end of the vigil. Although vigils are normally held on Saturdays, the April vigil will be held on Sunday, April 2. For more information about the vigils, contact Rev. Deborah Lee at dlee@im4humanintegrity.com. 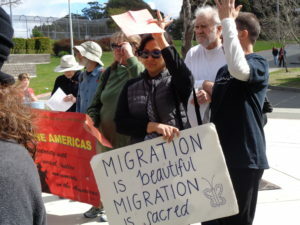 Information about the two largest private, for-profit prison companies, CCA (Corrections Corporation of America) and GEO Group, can be found here: (http://grassrootsleadership.org/reports/payoff-how-congress-ensures-private-prison-profit-immigrant-detention-quota#4). How I wish that everyone could read this account and tap into the depth of humanity expressed!